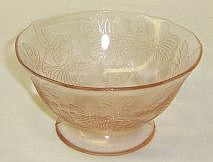 This pretty pink Dogwood Apple Blossom depression glass Footed Sherbet was made by MacBeth-Evans from 1929 to 1932. This Sherbet is in excellent condition with no chips or cracks. Be sure to search our other Dogwood items available. We guarantee all items to be as described. THANK YOU. 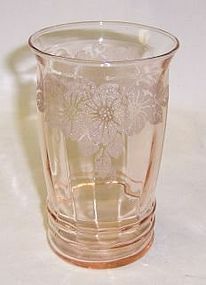 This really pretty pink Dogwood Apple Blossom depression glass 5 Inch 12 Ounce Ice Tea Tumbler was made by MacBeth Evans from 1929 to 1932. This Tumbler is in excellent condition with no chips or cracks. We actually removed it from the original box, but the box is not good. Be sure to search our other Dogwood available. We guarantee all items to be as described. THANK YOU. 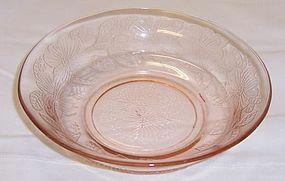 This really pretty pink Dogwood aka Apple Blossom depression glass 5 1/2 Inch Cereal Bowl was made by MacBeth-Evans from 1929 to 1932. This Cereal Bowl is in very good condition with no chips or cracks. Be sure to search our other Dogwood available. We guarantee all items to be as described. Feel free to email with any questions. THANK YOU. 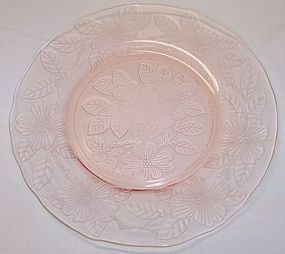 This pretty pink Dogwood depression glass 8 inch Luncheon Plate was made by MacBeth Evans from 1930 to 1934. This Plate is in very good condition with no chips or cracks. Be sure to search our other Dogwood available. We guarantee all items to be as described. Feel free to email with any questions. THANK YOU. 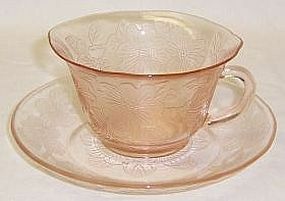 This pretty pink Dogwood Apple Blossom depression glass Thin Cup and Saucer was made by MacBeth-Evans from 1929 to 1932. Both the Cup and Saucer are in excellent condition with no chips or cracks. Be sure to search our other Dogwood items available. We guarantee all items to be as described. Feel free to email with any questions. THANK YOU.